The other elephant in the room: Amazon.com, which saw a whopping 46% increase in retail sales between 2009-2010, and who also sells Craftsman. This makes sense to me — once I went Prime, I never went back, and anecdotally, the same seems to be true of a lot of folks. Could giant retailers like Amazon or Costco outsell longtime companies like Sears with their own products? And how might this move affect Craftsman in terms of quality or warranty? Let us know what you think in comments. Thanks to Flickr user tedmurphy for the great CC-licensed photo. I love Sears tools. I especially like that $500 set of tools in the large plastic suitcase arrangement that I saw in their catalog recently. Go Costco! Sears didn’t buy K-Mart, Audra. Now that K-Mart is expanding into Costco, maybe they can pay back some of the people they stole from when they went bankrupt, before buying Sears. I also saw them at menards the other day. As for quality their ratchets have steadily gone down in the last few years. I think this is partly due to them selling “premium” ratchets also. In the end I support Craftsmen and I hope the quality stays “better than Chinese”. Yawn. I used to only buy Craftsman wrenches/sockets for the lifetime warranty – now I buy HomeDespot/Lowes brands as they are cheaper and have the same warranty. I have never bought Craftsman power tools, not cost effective. The Eddie Lambert is driving the ship at Sears and the sales of the Craftsman line into other outlets is his initiative to get some return on his investment that he knows will not come out of improved store sales at Sears. Menards is ONLY carrying close-out Craftsman tools, still a bad move in my mind. I dont know the long term impact on the Craftsman brand by moving sales through other stores, I am more concerned about the energy Sears is putting behind finding the best tools to make Craftsman. Craftsman is doing a great job of promoting the brand, pretty sure they arent spending the resources they used to “make” the tools….too bad. Coming Soon! Craftsman at Wal-Mart. Seriously though, it would not be a big surprise. Of course, the cost would have to come down as well-meaning the quality will drop as well. I tend to agree with Kris. If I can get the same warranty on a similar product for quite a lot less cash, that’s where I’ll go. Lowes and HD aren’t likely going away anytime soon so their warranty is as good as any. Not like the old days when Craftsman was the only one offering a lifetime warranty on their tools. I was quite surprised yesterday to walk into Costco and see a pallet of Craftsman 3 drawer toolboxes. That was all they had, but that store doesn’t really stock a whole lot in the way of home improvement stuff anyway. Interested to see what the other Costco I frequent ends up getting. They stock a lot more in the way of tools. I seem to recall that the Orange and Blue Boxes required a receipt for the lifetime warranty on their tools. Has that changed? There’s something about Sears and their more or less no questions asked tool swap that has kept me a loyal customer. I’ve never had a problem exchanging a tool there, even the universal joint that I welded into a flexible elbow by crossing the terminals of a large battery. Is this a sign that Sears / Craftsman may be in financial trouble ? I hope not. I think so. To me it smacks of major desperation. Earlier this year I remarked how there were no sales reps in the Sears hardware dept anymore, just cashiers and stock persons who know nothing about the products. The Craftsman line was historically what brought *men* into Sears. If they sell their wares at Costco (I’ll be looking for it now!) … there’s simply no need for me to go to Sears, ever. When I first began buying Craftsman hand tools 30 years ago, There was a huge divide between ultra cheap junk and expensive quality tools (like Snap-On, Gray, Mac, etc). Craftsman was the only decent quality tool that was warranted for life. Today there’s a ton more competition in “decent” tools and Lifetime Guarantees are ubiquitous. Sears will continue to sell their ever-worsening tools in a growing number of venues, until we can buy a cheesy little 1/4 drive socket set in an altoids tin from the impulse rack at the supermarket checkout. Today’s Craftsman tools look like the Craftsman tools I grew up with, but that’s where the similarity ends. It’s overpriced junk, trading on its once-proud name, with the MBAs in the front office cheering the brand’s race to the bottom. May as well buy now, next year’s stuff will be even worse. I never bought much at Sears – and I had always thought of Craftsman Tools as mostly for automotive trades and shade-tree mechanics. A race to mediocrity and the lure of quick profits at big-box stores for tool manufacturers is something that has me a bit concerned. Relatively speaking, I think that the Internet and Big Boxes have driven the price of tools down – even in real terms – compared to the 1960’s when I started buying tools for a living. While I can still purchase quality tools – some of my old favorite brands (Porter Cable, Vise Grip, Ridgid etc. )are now affixed to a much different mixed-bag of products. Maybe this is just a lament of old age – or misrembering old days that were not as good as the memory of them – but some of the old tools still perform as good if not better than their modern equivalent. I’ll put our Oliver Rip saw up against a modern tool anyday – and our 2 Oster Threading machines are likely to outlast their much newer Ridgid cousins. Our old PC sanders and planes will likely many-times outlast a modern replacement. Kmart brought sears. I should know because I work there. Harbor Freight offers a lifetime warranty on hand tools too. no receipt required. Its kinda funny no receipt is required because a few of the things i’ve bought there have no label on them, and are no longer made. So its basically liek they are taking back some random product in inexchange for something similar and unless you really know your HF stuff you’d not even know if the broken tool was sold by them. Sears Holdings Corporation (NASDAQ: SHLD) is a major retail conglomerate formed in 2005 by the merger of Sears, Roebuck and Co., with Kmart Holdings Corporation. It is probably a good thing for them to expand their market. I can only wish that some of our own made in USA tool manufacturers would do the same. Not being a regular for my local Snap-on truck means having to call him out or to order tools online. If there was a retailer anywhere near me locally,it would be a lot handier and would probably lead to me making more impulse purchases when I got to actually see the tools in my hands. Like Woodcraft does with Festool. If it were not for the internet, I would not have access to many tool manufacturers. I think that the Internet and Big Boxes have driven the price of tools down – even in real terms – compared to the 1960′s when I started buying tools for a living. While I can still purchase quality tools – some of my old favorite brands (Porter Cable, Vise Grip, Ridgid etc. )are now affixed to a much different mixed-bag of products. I think that they ARE making the tools cheaper these days.They are not produced to the same standard of quality and durability they were once engineered to. It would seem to me that these days, most of the tool manufacturers are all about making money for themselves and not about delivering the highest quality products they can. I think we ourselves are partly to blame for this, by always purchasing these cheaper products. In some cases, there are no alternatives left. Can’t even buy a new, made in USA circular saw. In some cases it is the manufacturers that are doing this to themselves as well, offering tools to everyone, instead of what they did in the 50/60s, predominantly supplying the trades, with only a few companies catering to the general consumer or, as some had, a pro and a consumer line. Did you know Porter-Cable has reissued the Porta-plane? They now call it the 9118, and it’s going for $600. I’m wondering if it is as good as they used to be. Good at least for the reissue of the cutters, my supply has run low. I have 3 Costco’s closer to me than the closest Sears store. This definitely makes their wares more accessible to me – albeit a subset. I have often wondered if Sears would be better off taking their well-known brands (Craftsman/Kenmore), selling them in tool/appliance stores, and killing off the clothing portion of their stores (but not Lands End). We have visited this topic in these pages before, when the announcement that Craftsman would be sold by Ace stores came out. This is another way for Sears to protect one of its brands from disappearing while they close store after store. Their soft-line sales are sinking the ship, and the hard-lines can’t keep it afloat. 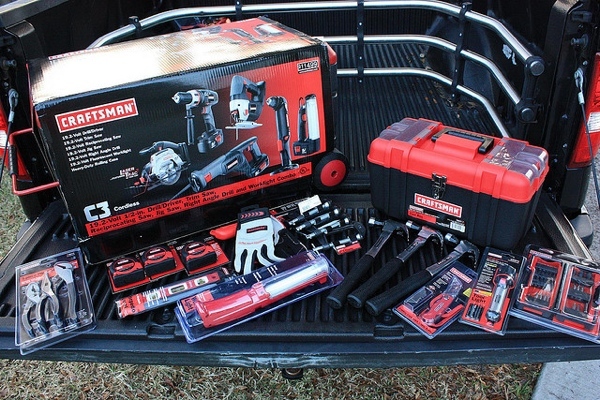 Those products in the picture are most assuredly not the USA made versions of Craftsman tools. Even in Kmart, you will find mostly imported products w/ the Craftsman tag. I’m sure that is a decision made by the retailers involved more than by Sears. They know their customers! >>Sears Holdings Corporation (NASDAQ: SHLD) is a major retail conglomerate formed in 2005 by the merger of >>Sears, Roebuck and Co., with Kmart Holdings Corporation. This is true — thank you for clarifying that. My mistake! Audra, KMART purchased Sears back in 04, KMART holdings was renamed Sears Holdings after the deal was complete. The name change is due to Sears being a better brand name than KMART. It’s was not a merger of equals. I grew up thinking of Craftsman as the benchmark of quality tools, but I stopped buying them years ago as the quality of some of their carpentry hand tools declined. Even with a lifetime warranty, it’s just not worth the hassle to continually have to replace defective items. I dropped by a Sears store recently, looking for a deep well impact socket needed for one of my jobs nearby. The paltry selection of all tools and the disinterest of the “sales” staff was disheartening. At least when it comes to tools, Sears is just a shadow of what they used to be. Those old Craftsman catalogs had the best displays of tools ever. Hundreds of parts, all laid out with equal spacing between the parts in an arc around the tool box (included in the set). Page after page. They really knew how to make a tool guy drool! Sears blew their Craftsman name by being flaky … and they are still doing it. Once upon a time *all* hand tools bearing the Craftsman name were very good quality and lifetime guaranteed. Sometime in the 1980s they tried offering a black handled “Pro”(lifetime)line and a red handled (non-guaranteed) line. Due to complaints and confusion, in the 90s they reverted and began guaranteeing any tool again. By 2000 they were using *red* to indicate their Pro line of *power* tools, causing yet more confusion. Today, after posing questions at my local Sears outlet, I was told the word “Pro” simply denotes the presence of an extended warranty that extends beyond the manufacturer’s 1 year replacement and doesn’t indicate the actual tool is any better or different. Although you get a “lifetime” warrantee, the last time I tried to replace a screwdriver at HD they told me that I had to send it back to a warehouse When I have a bad screwdriver from Craftsman I just take it back to the OSH store and get my new one. The warrantee isn’t worth the paper its written on if you have to pay postage and wait 2-3 weeks to get a replacement. Expect even more Craftsman branded tool to be made in China, even the basic mechanics’ tools like sockets and wrenches at some point. The wrenches are already there. Craftsman has discontinued the Professional line entirely, and now ALL of the ratchets, wrenches, etc are made in China. The only USA-made stuff left is the screwdrivers and sockets, but that’s just because they have a few years’ worth of stock. The way things are going, it will ALL be China-made soon. No more Danaher, no more USA, no more American jobs. I would guess that most of not all of the stuff that will be in Costco is the made-in-China stuff. They get so much it would probably not be an issue to just get more shipped over for as many stores as they can put it in. I won’t be buying the China stuff though, whether it’s at Sears or Kmart or Ace or Costco, unless it’s at fire-sale/clearance/closeout prices. I’d feel like an idiot paying full price for a cheap made-in-China tool that used to be made in the USA. People are getting snowed by Sears when they make the tool look the same, the packaging look the same, but silently omit the Made in USA logo and add “Made in CHINA” to the back. Not that there’s anything wrong with quality tools made in China. It’s just a horrible business practice to switch them with USA-made tools and then charge the same price. I’m sure the Costco setup will work great for awhile though, but just like so many other iconic American brands that sold out, the Craftsman name will be watered down by this. Even if it is sold in more places and becomes more popular, they are alienating their core customer base, which is really bad business. Cool, maybe I can get Lithium batteries for my 19.2 cheaper than 80 bucks a pop. I only have one NiCad left… just cannot justify the price of this Lithiums considering the NiCAD lasted only a year with occasional use. of course like your website however you have to check the spelling on quite a few of your posts. A number of them are rife with spelling issues and I find it very bothersome to inform the reality nevertheless I will definitely come back again.